Professor Essam Marouf in his lab (Photo: James Tensuan, ’15 Photojournalism). One of the most remarkable space explorations ever conducted is coming to an end on Sept. 15, and a San Jose State professor has played an important role. 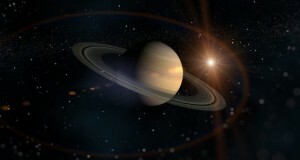 Design work for the Cassini-Huygens Mission began 26 years ago with the goal of providing mankind its first close-up view of Saturn and its rings, atmosphere and moons. The 22-foot-long spacecraft was launched from Cape Canaveral in 1997, and spent the next seven years traveling to Saturn. Marouf is one of the original members of the Cassini Radio Science Team, which used radio waves to learn about the Saturn system. The Huygens probe even landed on Titan, one of Saturn’s moons. 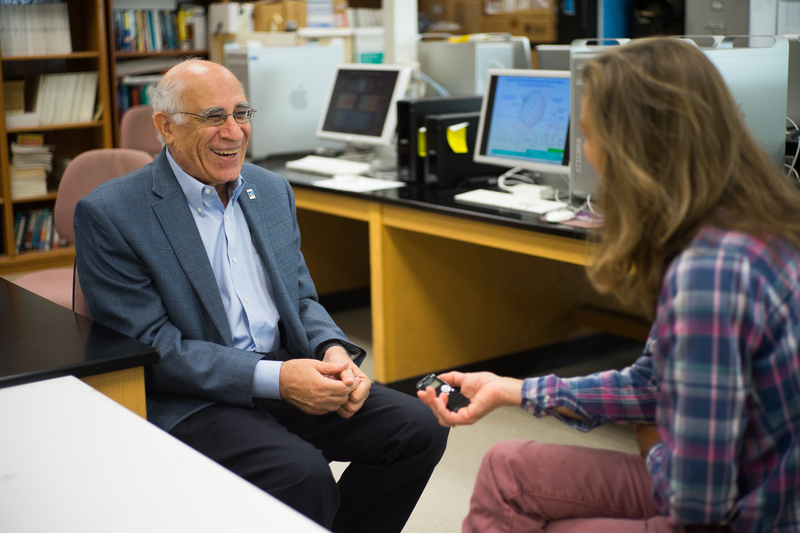 Professor Marouf is interviewed by Mercury News reporter Lisa Krieger (James Tensuan, ’15 Photojournalism). From his lab right here at SJSU, Marouf and his students have been analyzing data collected by Cassini, making important discoveries, along with scientists from 26 nations. Among the most significant is the discovery of a methane sea on Titan, described by NASA as strikingly similar to Earth in a deep freeze of minus 290 degrees Fahrenheit. Many news reporters came to campus Sept. 13 to interview Marouf before he departed for Pasadena, where he will witness the disintegration of Cassini. The spacecraft is almost out of fuel, so operators are deliberately plunging Cassini into Saturn to ensure its moons will remain pristine for future exploration. “I have mixed emotions,” said Marouf, who has celebrated Cassini milestones with his family including his wife, daughter and two granddaughters. Posted by the New York Times April 29, 2013. And on Wednesday, San Jose State announced that next fall, it will pay a licensing fee to offer three to five more blended edX courses, probably including Harvard’s “Ancient Greek Heroes” and Berkeley’s”Artificial Intelligence.” And over the summer, it will train 11 other California State campuses to use the blended M.I.T. circuits course. “We get to hear the ‘aha’ moments, and these all-caps messages ‘THANK YOU THANK YOU THANK YOU,’ ” said Rachel Meltzer, a former clinical research manager at Stanford and mentor who is starting medical school next fall. An earlier version of this article misstated the institution from which Rachel Meltzer, a mentor for the online provider Coursera, graduated. It was Washington University in St. Louis, not Stanford (where Ms. Meltzer worked a clinical research manager). SAN JOSE, CA – San Jose State University invited members of the media Oct. 18 to experience a collaboration with edX, the transformational new online educational initiative founded by MIT and Harvard, resulting in SJSU’s first “flipped class.” View a video of the news conference. 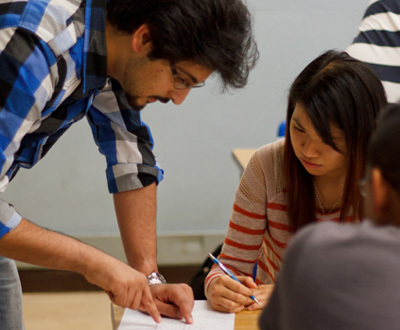 Preliminary results described in The Chronicle of Higher Education suggest this class, which is using an electrical engineering MOOC (the MITx 6.002x Circuits and Electronics Massively Online Open Course), may be an effective way to reinvent and transform the academic experience of electrical engineering students. SJSU’s innovative effort brought together the not-for-profit edX, which offers interactive education wherever there is Internet access, and the only public university serving Silicon Valley. SJSU serves 30,000 students, including 4,600 engineering students on the threshold of the world’s leading tech companies including Adobe, Apple and Cisco. U.S. News and World Report recently ranked SJSU’s Charles W. Davidson College of Engineering third in the nation among master’s level public universities excluding service academies. This past summer, SJSU faculty members traveled to Cambridge, Mass., to meet and work with the edX team. Their goal was to integrate 6.002x materials into an SJSU course. Today, the men and women of SJSU’s first flipped class met their online instructor in person for the first time. The instructor for MITx 6.002x is Anant Agarwal, an MIT professor of electrical engineering and edX President who is capturing the attention of learners worldwide with his engaging, substantive online lectures. 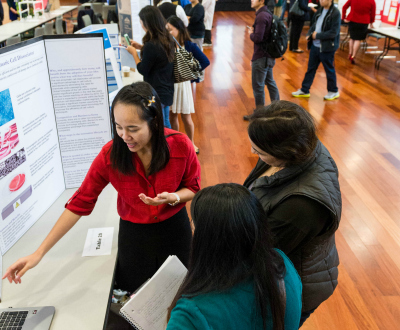 SJSU faculty members and students shared their experiences, including their midterm exam results. These results represent the first-ever, classroom-based preliminary data assessment of the San Jose State University experiment, designed to see if MOOC material can effectively enhance student learning in a for-credit class at a major university. SJSU recently launched a $28 million initiative to upgrade the campus’ information technology infrastructure while supporting faculty efforts to use and apply these next-generation technologies to better support student learning. 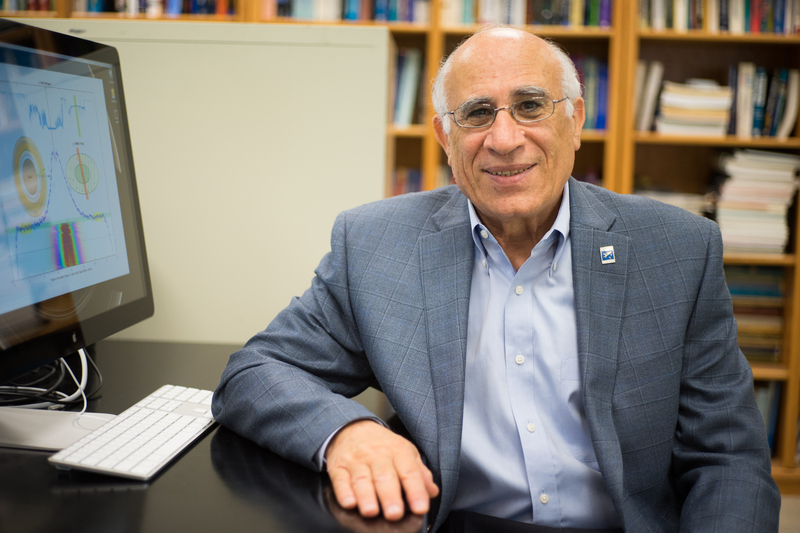 This effort is part of an even larger campaign led by SJSU President Mohammad Qayoumi, who argues educational institutions urgently need new approaches to teaching and assessing learning that are personalized, collaborative, engaging and that relate to real-world, 21st-century problems. 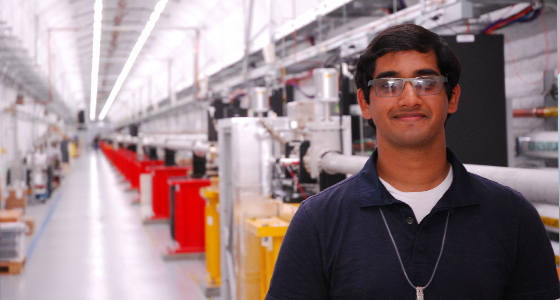 Tom George, Electrical Engineering’15, is an intern for this year’s SLAC Science Undergraduate Laboratory Internship summer program, where he uses lasers to test the terahertz signals on energy (Peter Caravalho photo). Every day, Tom George, ’15 Electrical Engineering, walks a mile and a half to get to the facility where he works, but he doesn’t mind. 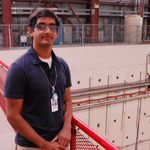 George is spending summer at the Stanford Linear Accelerator Center (SLAC) just outside of Palo Alto, tucked away on top of a hill and across 426 acres. George is one of 20 interns chosen to participate in this year’s Science Undergraduate Laboratory Internship summer program, which teaches students how to effectively do research, make a presentation and write a paper. 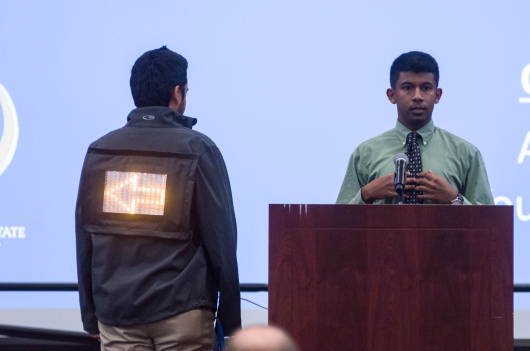 “People here are showing me how much more interesting physics can be than from what we get in the classroom experience,” George said. SLAC is a research lab operated by Stanford for the U.S. Department of Energy. For over 40 years, the two-mile linear accelerator has been on the forefront of physics research and is famous for looking into the structure of molecules. George works in the Linac Coherent Light Source facility, using cutting-edge lasers to test the recent progress of terahertz signals on energy. According to George, everything that he has worked on is brand new. He has had to learn a new lab program in order to take measurements and conduct experiments, not to mention working with lasers that use pump probe techniques. He’s even learning something about himself. “I’m learning that I get frustrated at times when things don’t work, but that I have to persevere and keep working and even start over if I have to,” George said. George’s experiences with professors and fellow students in SJSU’s Department of Electrical Engineering have helped him find a passion for teaching. Spherical Drive System team members Eamonn Clerkin, Henry Li, Max Ratner and Andrew Parmar (left to right) hold up parts of the frame for their motorcycle (Sarah Kyo photo). Will Smith’s character drives a sleek car with spherical wheels in the sci-fi movie “I, Robot.” While this futuristic film is a fantasy, a team of Charles W. Davidson College of Engineering students is making a very similar vehicle a reality. From conception to fruition, this group has spent more than a year on this ambitious senior project called Spherical Drive System: a self-balancing, electric motorcycle that uses spheres as wheels. 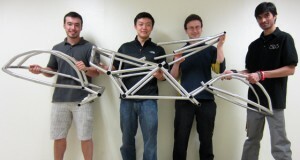 The team includes team manager Max Ratner, financial officer/mechanical designer Henry Li, and lead mechanical designer Andrew Parmar. While brainstorming project ideas, the team came across a YouTube video of a robot that balances on a ball. Parmar said they combined other inspirations, such as the Segway Personal Transporter and the “I, Robot” car, for their final concept. Riding a motorcycle involves balance and some level of instability. They said a sphere has benefits over a typical wheel. This computer rendering showcases the final design for Spherical Drive System (Image courtesy of Spherical Drive System). Ball transfer units, which are small ball bearings, keep the spheres moving. 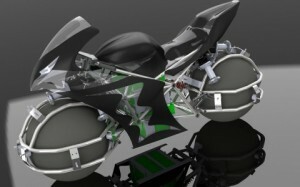 Spheres allow omnidirectional movement, meaning that this motorcycle could move in any direction, including backwards and sideways. Li said they decided to build a motorcycle because “it captures people’s imagination.” The team can imagine similar, spherical technology used in other areas, including wheelchairs, forklifts and amusement park rides. Professor Winncy Du, who is Spherical Drive System’s faculty adviser, said she has never seen a senior project like this one. The team has assertively gained sponsorships, including monetary donations and parts for their vehicle. They have even attended job fairs, not for finding a job but to gain support for their project. Li said at the moment, they could use help in manufacturing molds for the spheres, which are a composite of carbon fibers, fiberglass and synthetic rubber. Ratner said their senior project has been a lesson in communication and team building, in addition to gaining technical experience. He encourages students to take initiative with their project ideas. Last March, Ratner and Parmar represented Spherical Drive System in the American Society of Mechanical Engineering’s regional district student competition. 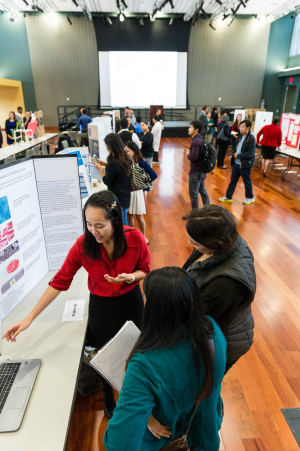 Parmar earned first place in the oral competition, and Ratner earned second place in the poster presentation. Parmar will advance to the national competition in Houston this November. The team devotes hours to this project. Ratner, Li and Parmar estimate they each put in 20 to 30 hours per week on top of school, work and other commitments. Their project deadline is May 16, but they plan to continue working on the motorcycle this summer to get it ready for test riding. Follow along with Spherical Drive System’s updates at its Facebook page. For more information, visit the project’s website. 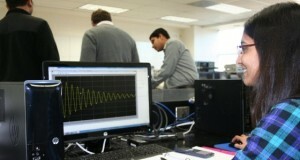 Electrical engineering graduate student Shweta Panwalkar studies in the new lab (Charlotte Lawson photo). The Charles W. Davidson College of Engineering cut the ribbon Nov. 30 on its Center for Analog and Mixed Signal, and not a moment too soon. “There have been few better times for students to go into analog,” Dean Belle Wei recently told San Jose Mercury News business columnist Mike Cassidy. “Analog chips, or chips combining analog and digital design, are needed to capture images and sound and translate them into digital information for transmission or storage, for instance. Without analog there would be no digital revolution,” Cassidy wrote. 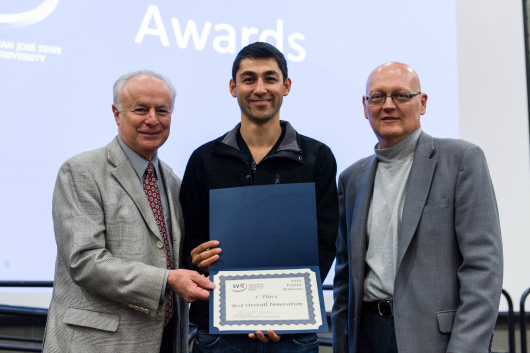 The center’s research projects seek solutions to the some of the most challenging issues faced by semiconductor industry today through developing new circuits and architectures, said its director, Assistant Professor of Engineering Shahab Ardalan. The lab contains design and test equipment for analog and mixed signal integrated circuits. Six designs stations are equipped with state-of-the-art computer-aided design tools and field-programmable gate array platforms along with 10 mixed signal test stations. Texas Instruments, Maxim Integrated Products, and Dr. Gust Perlegos contributed to the project, where grad students were already hard at work that afternoon. “These are the students we’ll be looking for in the future,” Maxim’s Kristoff Richter said. “They’ll be spending a lot of time in this lab.